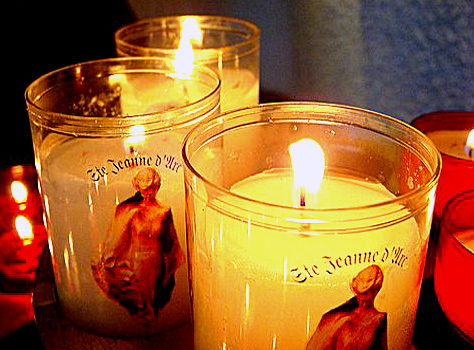 CELEBRATE Joan of Arc’s Birthday! "She is easily the most extraordinary person the human race has ever produced." January 6, 2012 marks the 600th anniversary of St. Joan of Arc’s birth and there are few people in all of history as deserving of honor and remembrance on their birthday. As Mark Twain very accurately said of Joan: "She is easily the most extraordinary person the human race has ever produced." For this reason all of 2012 is being called the year of Joan with many celebrations taking place worldwide throughout the year starting with parades held in Paris and in New Orleans on January 6 to celebrate on the day of her birth. You don’t need to attend a large event to celebrate, however, as we can all take a moment on Joan’s birthday this Friday to remember her and honor her. I encourage everyone to light a candle for Joan on her birthday. I have been celebrating this way for several years and there is something almost mystical about lighting a candle and taking a few quiet moments to remember Joan and to reflect upon her life and all that she has come to mean to so many people.